Karate-do is a martial art originated in Okinawa, modified and transformed into a way of life by Master Gichin Funakoshi. Until before these modifications, it was just a group of techniques that permitted self-defense without weapons other than your hands and feet. Though there was some Chinese influence, the development was Okinawan, and later mainland Japanese. Master Funakoshi, inspired by traditional martial arts from the main Japanese islands (kyudo, kendo, judo for example) modified Karate, that until that moment could have been called Karate-jutsu, a fighting art, and emphasized the philosophical aspects. This way all that was learnt could be extrapolated to the daily life of the student. This is why Karate is a way of life: Karate-do (do, means way or road). Gichin Funakoshi, thus, combined Karate techniques with traditional Budo (the martial way), inserting the essence of Budo in the heart of Karate. The word Karate is also formed by two characters, the first one kara (empty) and the other te (hand), the first one having many ways of defining it. 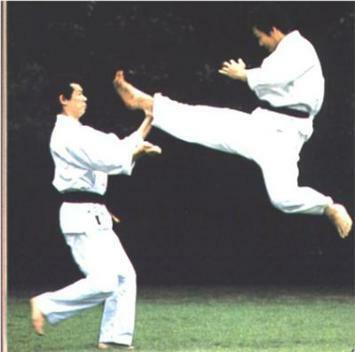 The first definition is the least subtle and the most straightforward, through the practice of karate, self defense techniques are learnt, where no weapons are needed, other than hands, feet or other parts of the body. The second one, and in the words of Master Funakoshi: "Just as it is the clear mirror that reflects without distortion, or the quiet valley that echoes a sound, so must one who would study Karate-do purge himself of selfish and evil thoughts, for only with a clear mind and conscience can he [she] understand that which he [she] receives. This is another meaning of the element kara in Karate-do." Another meaning given by the Master is that of always striving to be inwardly humble and outwardly gentle, thus meaning an internal emptiness of egoism and acting gently and moderately. Finally he talks about the elemental form of the Universe, which is emptiness (kara, ku), "and thus, emptiness is form itself. The kara of Karate-do has this meaning." After what's been said, it is clear that Karate-do and Karate Budo are much, much more than mere self-defense techniques, actually, such a definition is a far shot from the real essence of Karate as a philosophy, which strives to develop the inner qualities of a human being and the search of perfection of your character, through strenuous training in the do and budo martial arts.